Endeavour Veterinary Ecology P/L is an Australian company based in Toorbul, Queensland, that provides specialised ecological, veterinary and wildlife management services. We have a high level of expertise in the management of wildlife, particularly koalas, including wildlife population health assessment, veterinary population management and reproductive control, disease surveillance and ecology, disease investigation, scientific research and development of koala management plans. 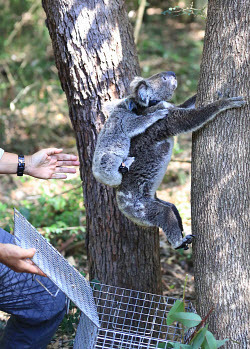 We also provide training in safe koala capture and handling, veterinary procedures and koala management, and remote drug delivery methods (use of dart guns and blow-pipes). Endeavour Veterinary Ecology develops and delivers humane and best-practice solutions to wildlife management issues. We are uncompromising in providing services and solutions to our clients that ensure high standards of animal welfare and optimal ecological outcomes.